When my son, who is an internationally recognized expert in RF Interference, heard me mention the “Magic Light Bulb” for the DCS signal, he laughed. That did it. I got him to promise to design a proper gizmo for the track communications signal. When I got ready to tune my Run Room track he came through with a filter for my bus wired track. 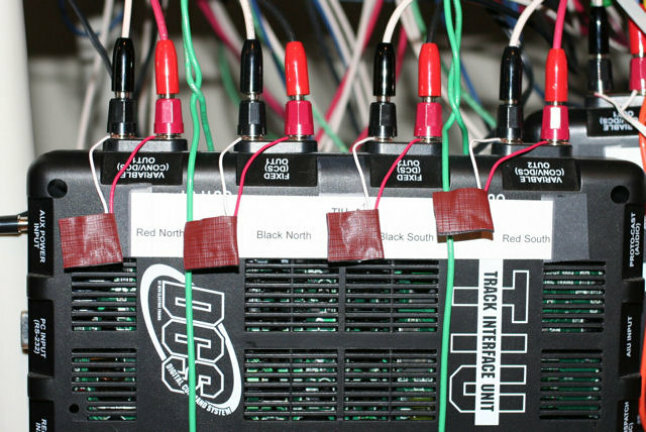 This Track Signal Filter gives a dependable signal to all blocks in a large bus wired layout with a common ground. This Track Signal Filter replaces the "Magic Light Bulb", uses no power, and creates no heat. You can make your own filters fairly easily and they are quite inexpensive to build. The filter consists of a resistor and capacitor of specific values wired in series. The filters work best in pairs (one across Track Interface Unit <TIU> output terminals, and the other at the ‘farthest’ point from the TIU output). 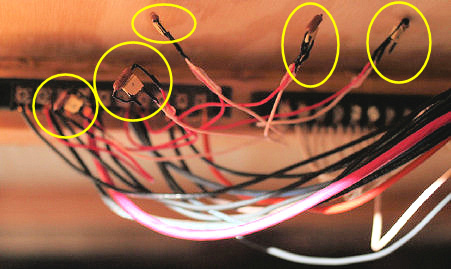 Before checking track signal on a model train layout, be sure the track and wiring installation is sound. Run trains in conventional mode for a while to be sure there are no electrical dead spots or faults. Blocks must be insulated at the center rails. Rail must be clean for conducting signal to and from engines and operating cars. Power wires must be large enough to carry anticipated current. Tap wires to track from power bus can be 14 or 16 gauge solid and should be soldered to track. 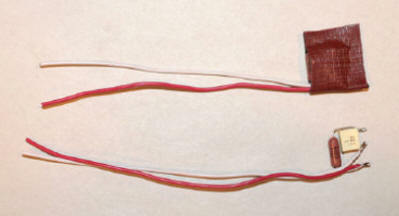 The common wire (to outside tracks in 3 rail) must be larger than the feeders (variable voltage wires) when there are two or more feeders in a run. All wire should be loosely supported and untwisted. All wire connections must be tight enough so the wire cannot be pulled out of the connection. Limit track length in a block to 90 feet or less. When feeder wires to track are tightly bundled (as in conduit or wireway) the track lengths will probably have to be shorter. For switched track use switches rated at a minimum of 5 amps. For every block that needs signal improvement, install a filter across that set of TIU Output terminals. Install a second filter at the ‘farthest’ point from the TIU output. If there are two 'farthest' points (after the power Y’s) two end filters are used. 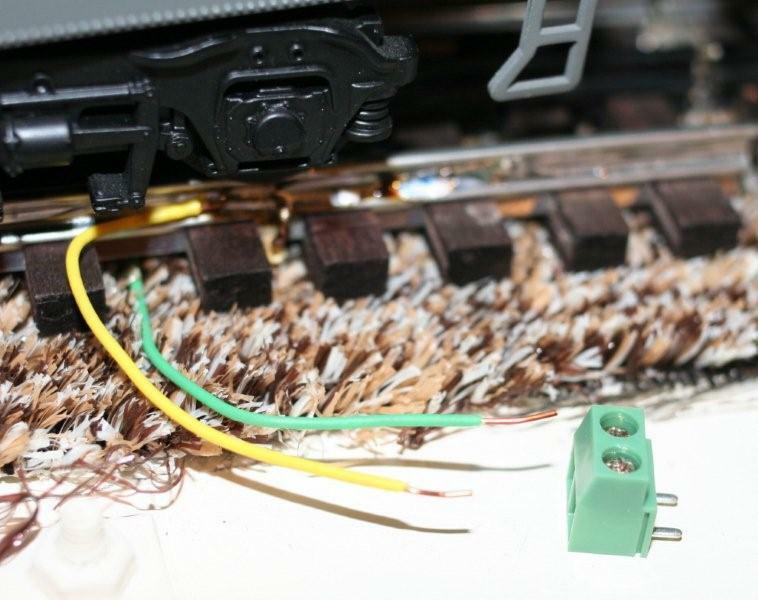 Keep filter wires separated and as short as practical. The key words for filter installation are at "Start/TIU Outputs" and "Farthest Point from Start". "Farthest Point" can be the farthest tap to the bus wiring. Filters may be added as needed with no ill effects. For a more precise "farthest point" install with a terminal block shown below with green wire soldered to center rail and yellow wire soldered to outside rail. The test engine should be the only Active engine in the remote (after you "Read"). The large diesels with multiple pickup rollers are best. When running "Check Track" with the engine, use your newest engine. While using "Check Track" the remote has NO control over the engine. "Check Track" must be turned off before control is restored. After exiting "Check Track" the engine may have to have a Factory Reset before it will return to normal. Before resetting try to increase sound volume. A better way to check track signal is to advance/reduce the thumbwheel on the remote one "click" at a time while running engine through block. The LCD Display will show you whether each "click" is seen. 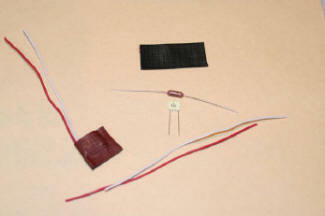 This filter is a wire-lead carbon resistor with a low-ESR, low inductance capacitor in series with one another.